Class NG L-5, originally built for CGR as 4 compartment L-4's, SAR upgraded them adding in a toilet, re-classed at L-5's. Built in 1904 by Bristol Carriage & Wagon Works, seats 18. Same as No 57 above, No 58 is currently being restored, and No 59 is waiting to be restored. Class NG-N-3. Built in 1903 by Boume & Marpet , this coach has 3 compartments and a guards section, it seats 18 in total. Class NG N-3. 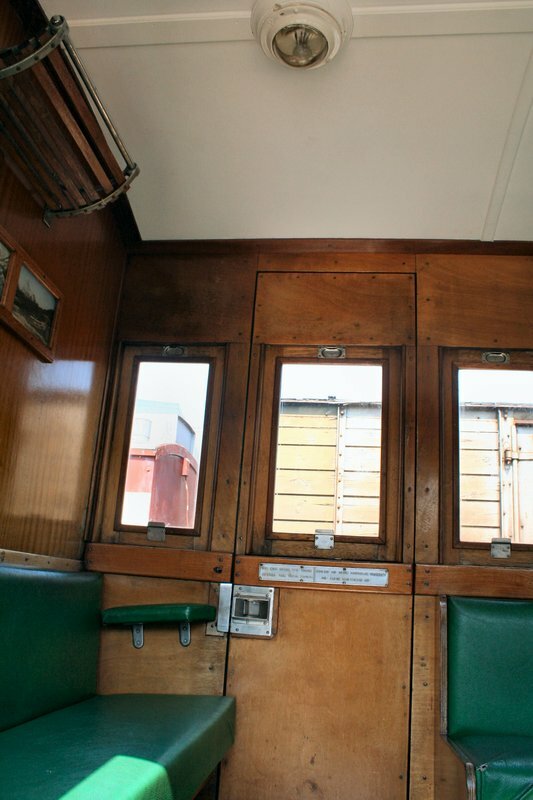 Built in 1903 by Metropolitan Amalgamated R & C Co., 3 compartments and a guards section, it seats 18. Class NG S-5, No 82 is waiting to be restored, No 85 was modified and re-classed LS-7. Built by Metropolitan Amalgamated in 1907. Class K-2, built in 1905 by Bristol Carriage and Wagon, converted from a 3rd class composite T-2 to passenger van in 1927 at Humewood Road workshop. The 'Apple Tavern' stocks refreshments, sweets, chips, souvenirs and has a first aid kit. Class L-15, converted from 3rd class composite T-1 to K-2 in 1927, it was converted to L-15 in 1985. Built by Bristol Carriage and Wagon in 1905. Built in 1916 by the S.A.R. workshops in Salt River, Cape Town. Class L-13. Built in 1927 by Sachsische Waggon, adorning the walls is a memorial plague to Aletta Schudel b. 1938 - d. 1997, and beautiful photos depicting NG scenes. Class O-2C. Built in 1927 by Sachsische Waggon, notice the beautiful wood interior. Class L-16. Built in 1931 by S.A.R. - Salt River as class S-6, toilet added and re-classed as S-9 (date unknown), converted to a private saloon (Class AXB) in about 1970, in 1985 modified again and re-classed as an L-16. Class V-2 'Mini-loaf' guards van, although classed and numbered as a goods wagon it is in fact coach stock and can seat 9. Class V-15 guards van, built in 1969 and recently converted to a coach for the disabled with toilet facilities and entry and exit ramps, photos show its old livery and the new green and white livery. found on the Train Modellers Narrow Gauge pages.